I would love to know if anyone can tell me anything about Aldwych Arabesque, aka April (Sunray Scelebrity/Llanarth Rosetta). She was born on 14/4/95 and I bought her from BabsR when she was almost 2 and had a lot of pleasure and success showing her in hand. Sadly I found that by the time she was 5 pressure of work meant that I could not do justice to two ridden horses and I sold her to a showing home quite nearby and was able to keep in touch. 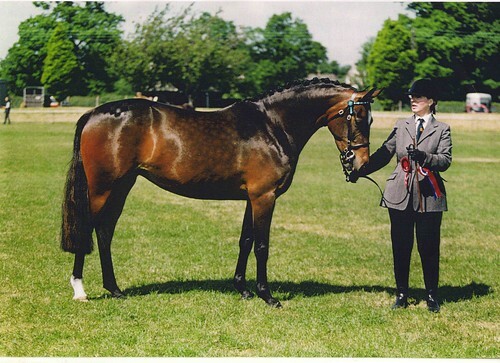 When her rider grew too tall for her (and bought a bigger half brother) April went to a showing home near Edinburgh where she was successful over a number of years in BSPS showing and Pony Club. I believe she was sold again about 2-3 years ago, possibly still in the Edinburgh area, to a mother and daughter who do Riding Club activities with her, but I have been unable to find out anything more specific. Any news would be much appreciated - many thanks. Agreed - she was always on my mind, and I see from the first post I have been looking for her for more than 4 years - just shows you should never give up hope! I also have a lot of new FB friends via looking for April and selling a harness on Friday which shows that it is a wonderful tool when used for the right purpose and not as some people do! Fantastic news, I love a happy ending. They are such a worry when you lose touch. I am, Callisto - she is the only horse I have ever sold and to hear that she has been in the same loving home doing a wide variety of things is just wonderful - I have thought about her so often since I lost touch with her. On what would have been Garnet's 32nd birthday I finally found April and I am happy to tell her AL friends that she has a lovely home, is fit and well at age 20 and recently completed an endurance ride! I'm so happy! Bumping up again in the hope that a new member will recognise her. Bumping up again in the hope that a new member may recognise her. Thank you. Will be out and about at the shows with them next summer, it will be a case of WATCH OUT WHIPPETS ABOUT!!! Sorry Meant to say Kath is on facebook, Hope you liked lottie the whippet. I lost touch with Kath after we sold April to Carly Brewer - please remember me to her when you see her again. I remember the first time we met you you told us that you had known April right from her birth. I'm just hoping that someone will recognise her on FB. I actually spoke to the lady who bred her today, kath tucker, she is out of horses now but i am sure she would also like to know the whereabouts of aldwych arabesque. I'm bumping this up in case any of our new members recognise the name. Her last known address registered with the WPCS is with the Whiteford family near Edinburgh, which is the last address I had too - Nicola Whiteford competed her successfully in BSPS classes and Pony Club. I am going to put her details on Scottish Rider FB page as she has not been re-registered and I feel she may have been sold locally rather than to a showing home. She is the only horse I have ever sold and I would dearly love to have news of her. Yes Babs, I'll certainly let you know if I find out anything about her. Thanks for that, tracingequines. I did find her on NED but there was no information other than her breeding so next port of call will be WPCS. She's with WPCS on NED under her name. Why didn't I think of that? She is registered with both AHS and WPCS but I don't know who issued her passport as she just had the registration document when she was with me. Thanks for the suggestion . Passport with WPCS, have you tried them ?